I'm back again today with lots or projects to share. 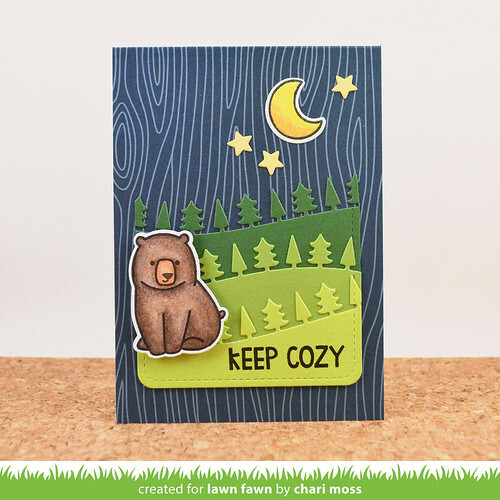 Today for Inspiration week at Lawn Fawn we are featuring the new Argyle Backdrops stamp set, Forest Border die and Stitched Hillside Border dies. 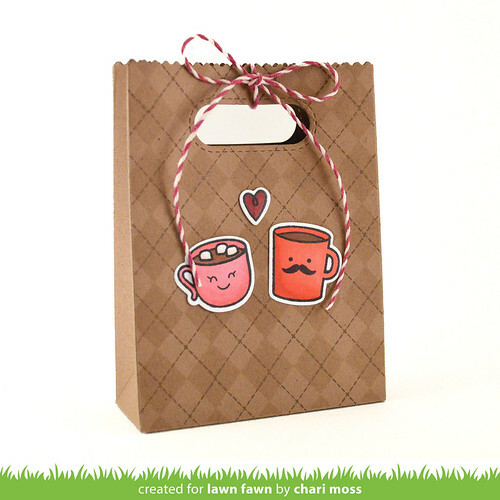 I have a couple projects using the new Argyle Backdrops, first up is this one also using the new goodie bag die and the Love you a Latte stamp set. I did a tone on tone Argyle with Hero Arts Soft Sand and Cup O Joe shadow inks on kraft card stock. The top is tied with the new Orchid Lawn Trimmings. I also created a card with the Arglye backdrops using pigment inks for a more bold pattern. The sentiment is from Chit Chat and the cute coffee cup is from the new Love you a Latte set as well. I cut the stitched leaves from kraft card stock and colored them with the same distress inks as my background and gave them a sprinkle of wink of stella glitter along the edges. I finished it off with a little hot cocoa lawn trimmings twine. Next up are the Stitched Hillside borders. These are awesome for creating scenes and there are 4 different hillsides to choose from. I used the new Sweater Weather Paper and stamp set along with the Stitched Rectangle Stackables to create this card. I used pigment inks to stamp the tree in colors that matched the papers and of course finished if off with a big bold scripty Thanks sentiment. My last card features the Forest Border Die. I cut out 3x4 journaling cards in various colors of green card stock then cut the edges with the border die. 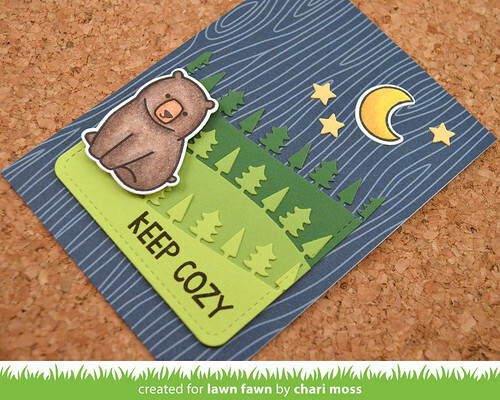 I used a blue woodgrain Lawn Fawndamentals card as my base and added the cute bear from Love You S'more and the moon from Spooktacular. The sentiment is from the Argyle Backdrops set, I love this font! 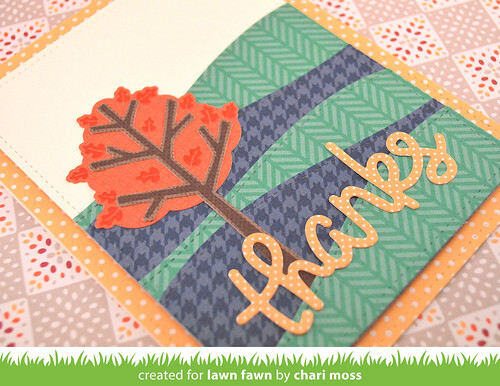 Be sure to check out the Lawn Fawn Blog for more projects using the Argyle Backdrops stamp set, Forest Border die and Stitched Hillside Border dies as well as a giveaway. these are adorable, Chari. I esp love the cute cluster of leaves and wee coffee cup (the colors are pretty) and that MUSTACHE on the other cup! CUTE! Your creations are brilliant! I love Lawn Fawn backgrounds, and this argyle set is a definite must have for me. On a final note... I am in love with that bear card! Thank you for sharing. 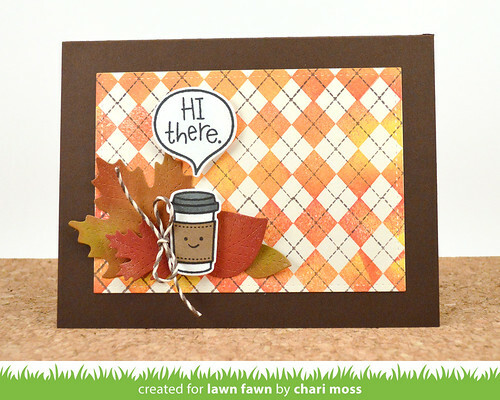 Saw your cards on the Lawn Fawn site...just wanted you to know how terrific they are. Such great ideas Chari! 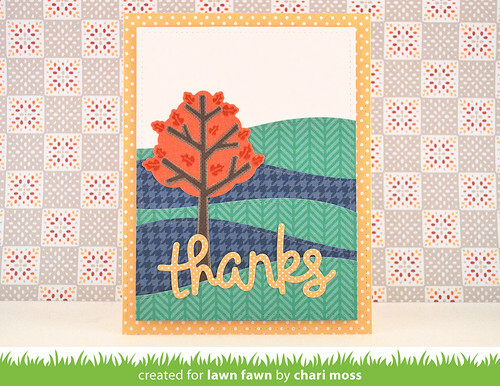 I am loving the tree card the most with the pattern papers and the pops of yellows and orange. Fall cards on a hot day? Yes, please! These cards are terrific, and I’m adding things to my list. 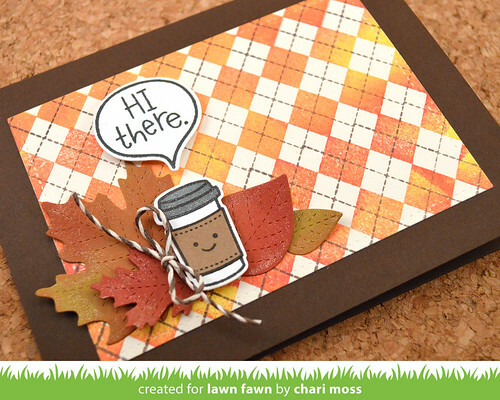 Such cute and fun Fall cards! Very cute little argyle background! Love the stitched journal card touch with the Forest border! Such lovely creations! The card with the stitched leaves and coffee cup is so so pretty! I love your designs! Chari, your cards and gift bag are si my amazing!!! EVERYTHING IS Simply adorable, love the inspiration. I love all of your sample projects, Chari!!! What an absolutely adorable Lawn Fawn release! I am going to have a tough time staying within my crafty budget on this one for sure!! Thanks for the creative inspiration! LOVE this whole card, well done! !